This painting is from a set of four of similar size and date. Much larger than his tempera paintings, they are Marco’s highest achievement in landscape painting at this late stage in his career. With their rivers, hill towns and dramatic mountains in the distance, the views recall Titian’s landscapes. 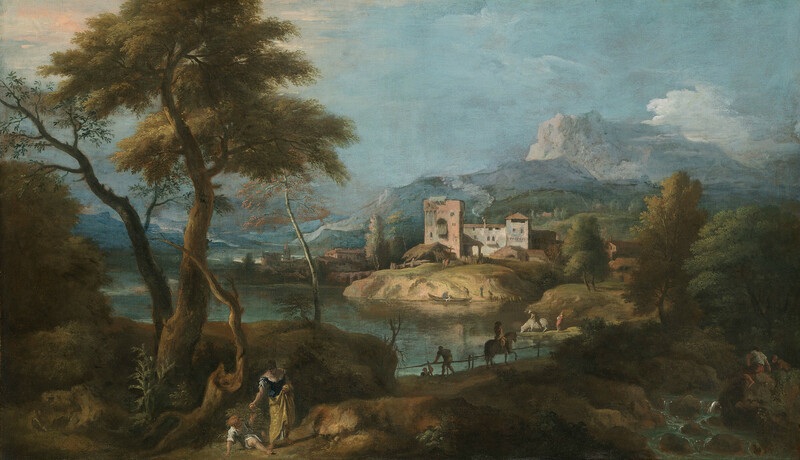 The castle in this painting is also found in the work of Titian and Domenico Campagnola and was a favourite landscape motif of Marco’s in all media. It was this type of landscape that was to have such an impact on Francesco Zuccarelli. Marco included motifs that had already appeared in his temperas and oils, such as the solitary tree in the foreground and the rustic castle, carefully arranged to create rigorously balanced compositions that lead the viewer on a journey through the landscape. His awareness of the way in which atmospheric conditions can transform a landscape are evident in the subtle transitions of light across each view, from full sunlight to shadow caused by passing clouds. Here, the castle catches the light and the eye is led in a meandering way to areas lit up by a bright streak of sunlight and finally to the snow-covered mountain in the distance. Marco’s familiarity with the countryside around Belluno thus enabled him to create imaginary landscapes that are also strikingly real. The ‘Italian List’ describes this series of paintings as ‘beautiful landscapes, the figures by the uncle’. While by now Marco could imitate Sebastiano’s figure style, since they had been collaborating for years, it seems that Sebastiano, his uncle, did contribute a few figures, usually in the near foreground in some of these paintings. The way in which Sebastiano’s figures are incorporated so seamlessly into each of Marco’s landscapes reveals how closely uncle and nephew worked together.